Now this is just sad: According to a recent survey, nearly half of Americans have no summer vacation plans, with a quarter of respondents citing affordability as the biggest factor for not planning a getaway. On the flip side, respondents who do plan to go on vacation this summer said that they intend to spend a median amount of $1,000 (millennials are most likely to spend that amount or less, while older generations are more likely to spend more than $2,000). 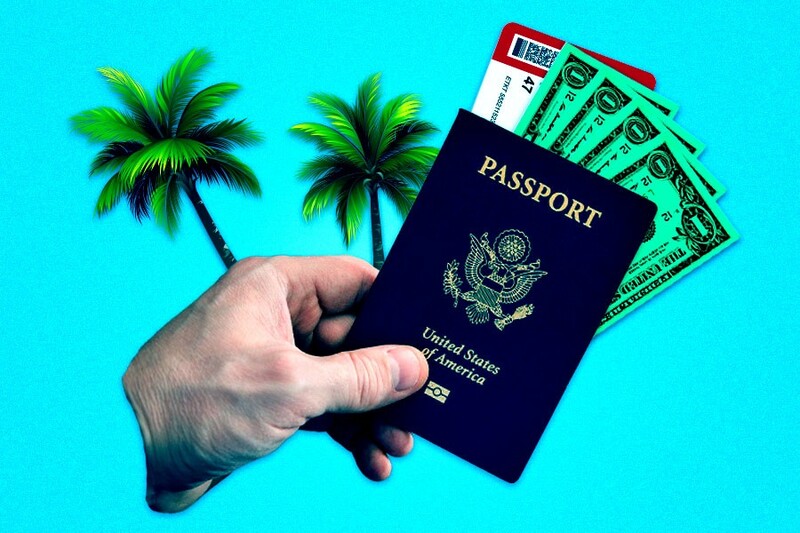 The fact that so many respondents can’t afford to spend even $1,000 on a vacation makes sense, considering a previous survey found that only 39 percent of Americans have enough savings to cover a $1,000 emergency. Naturally, the people who can’t afford vacations probably need them the most, since they’re more likely to be living paycheck-to-paycheck and spending their day-to-day stressing about work and money. Say it with me: I deserve a break! To that end, with the help of Matt Kepnes, travel blogger and New York Times bestselling author of How to Travel the World on $50 a Day, we’re putting together some money-saving tips so that you can plan a summer vacation that doesn’t cost an arm and a leg (and that doesn’t feel like you’re pinching pennies the whole time). Split Costs: “Find friends or family to split expenses with, as this will drastically cut your gas bill and accommodation costs,” Kepnes suggests. The more the merrier (and cheaper) I suppose. Join the Sharing Economy: “Use sharing economy websites, like Airbnb and Couchsurfing, to stay with locals for cheap,” Kepnes says. “Also, use rideshare websites to pick up other travelers who can chip in for gas.” Who knows? Maybe you’ll even find a new friend that you can split costs with on your next road trip. Get a National Park Annual Pass: National Parks are both cheap and a good source of a entertainment. “The annual pass ($80) will provide access to all of the National Parks in the country, and since each park costs $15 to $20, you’ll make your money back fast after just a few stops,” Kepnes explains. When you’re road tripping, you can also save money by driving the speed limit (despite how anxious you might be to get wherever you’re going): Studies show that fuel efficiency decreases as your speed increases, making trips more expensive for those who put the pedal to the metal. Also: Speeding tickets ain’t cheap. Finally, Kepnes also recommends travel hacking — using travel points and miles for free hotels — though, this can be a little complicated. If you’re interested, here’s a lengthy guide to travel hacking. When searching for cheap flights, Kepnes says being flexible with your dates and/or destination is of the utmost importance. “For example, if you want to go to Hawaii from July 10th to July 17th [when airfare pricing peaks], you’ll be hard-pressed to get a good deal,” he explains. “But if you want to go to Hawaii anytime in July or August, you’ll have a much better chance at finding that great deal.” Traveling midweek can also help keep your airfare costs down. If you need a little more helping finding cheap flights and lodging, sign up for email notifications that alert you every time a fare or nightly rate drops. These alerts can be found on sites like Kayak, TravelZoo and Airfarewatchdog. If you’re planning to go abroad, I’d also recommend picking a destination with a favorable exchange rate, where the local currency is worth less than the U.S. dollar (e.g., Brazil, New Zealand and Vietnam). Just be wary when doing so — more often than not, low-value currency is a sign of internal instability, which can make for dangerous traveling. Lastly, you can save tons of money by purchasing your own beer, wine and liquor for pre-dinner (or pre-lunch… or pre-breakfast) cocktails. When you actually get to the city, you definitely want to stay at a place with a kitchen (something many Airbnbs have), since eating out is almost always more expensive than cooking your own meals. And when you do decide to eat out, consider doing so for lunch instead of dinner — more often than not, lunch is cheaper (even at fancy restaurants you might want to frequent while in town). Indulging in street food, rather than eating at sit-down restaurants, is also a simple way to save a buck without having to cook every single meal (plus, street food in big cities is usually dank AF). It’s worth skipping the rental car as well. These days, you can easily get around large cities using a combination of public transportation (which is extremely cheap) and ridesharing services for less than the daily cost of a car rental. Lastly, If you’re looking for stuff to do, check out community calendars — which can usually be found online at local tourism websites — for cheap activities. There’s a good chance you’ll find something up your alley. It’s also worth noting that many museums are completely free, including the Smithsonian family of museums in Washington D.C.
Just remember: Once the frustrating planning is done, it’ll all be worth it — you’ll get a sweet vacay, and you’ll be able to pay next month’s rent.